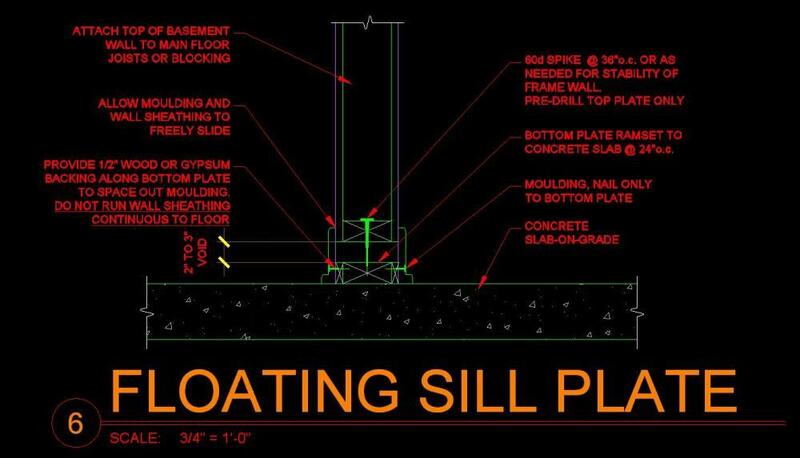 When I’m requested to investigate a house with structural concerns one of the first things I check is proper floating sill plates on slab-on-grade floors. I’m always amazed how so many basements are finished without a floating sill plate or some way of allowing the slab to move without moving the structure. I believe the problem starts with engineers not specifically detailing a floating sill plate. If they do, many of them are detailing it wrong. 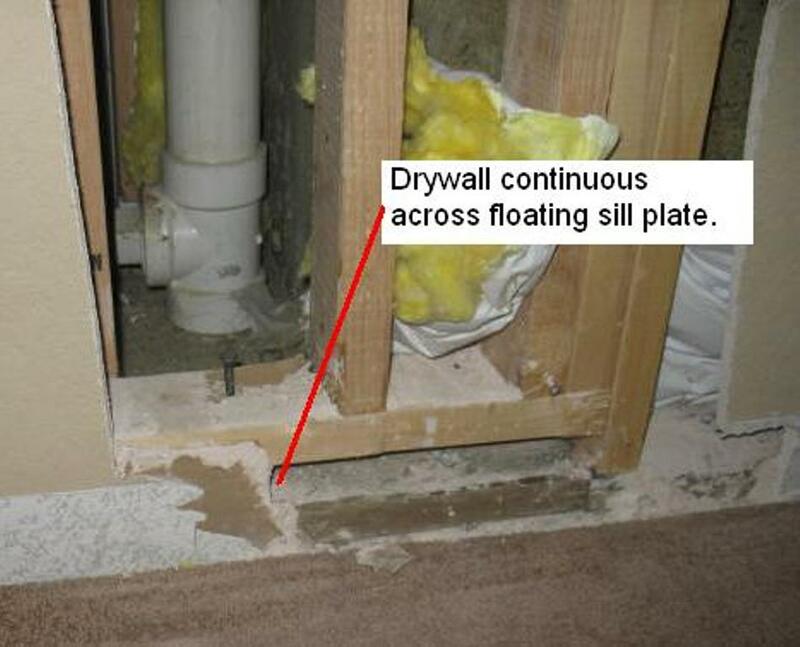 Compounding the issue is most basements are finished by the homeowner with the help of contractors with no information on a proper floating sill plate detail. The first thing everyone must understand is ALL slab-on-grades have a good chance at moving. The amount of movement, up or down, depends on the soil type, backfill compaction and existing or introduced water percentages. A soil report by a geotechnical engineer will typically provide you information about the risk your basement slab-on-grade may move. The risk can vary from low, moderate, high or very high. When a high or very high risk is encountered an elevated structural floor is typically the best choice, so the soil movement does not translate into the structure. With low to sometimes moderate slab risk a slab-on-grade can be used with precautions to isolate the slab-on-grade from the rest of the structure. The most common error that contractors or even some engineers make is assuming the gypsum board wall sheathing will just crumble if the slab pushes on it. This is not a good assumption to make. Yes, gypsum board is brittle and falls apart fairly easily compared to other building materials, but it does have strength. When the gypsum board is placed full height from slab to ceiling any movement in the slab can be translated into the structure. Jim Houlette observed this incorrect floating sill plate while working at a previous employer, MNA. Tired of all the holdown straps? You can eliminate many of the metal holdown straps from the upper floor wall to the main floor wall by modifying your OSB wall sheathing layout. 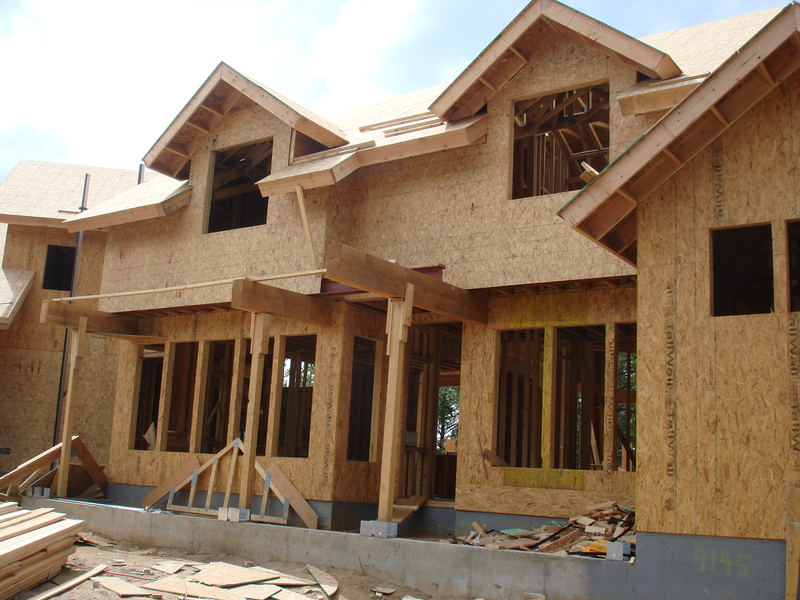 When the OSB wall sheathing is continuous over the floor framing section or lapped with the rim board uplift loads can be transferred. If you are utilizing prefabricated wall panels you can still have the OSB extend to the middle of the rim board. Just have the OSB extend below/above the plates as build in the shop. 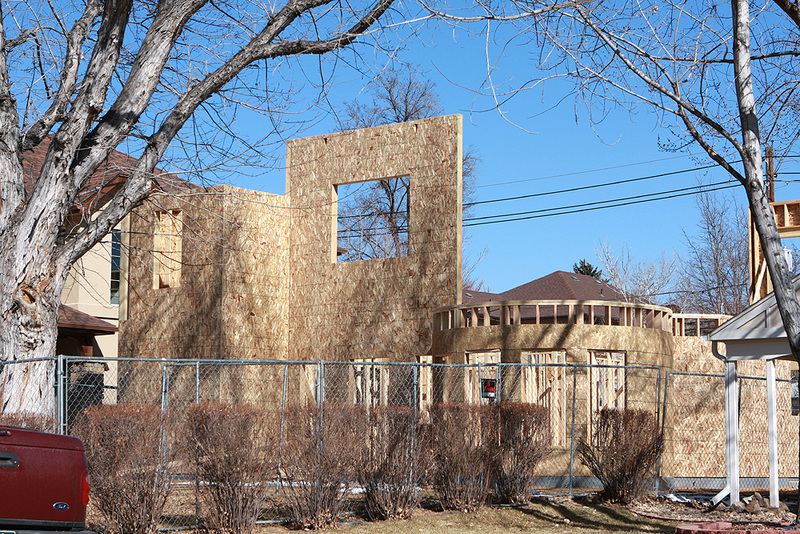 The only caution is, extra care is needed to prevent the overhanging OSB sheathing from being damaged during shipping. This concept can also be utilized at the foundation sill plate to help reduce uplift loads that would otherwise require embedded straps such as STHD10RJs. In that situation, cross grain bending is not desired on the sill plate as the load transfers to the anchor bolts. The cross grain bending can be removed from the equation using mud sill anchors (MAS) attached to the exterior face of the OSB sheathing in lieu of anchor bolts. A great solution when utilizing prefabricated walls. 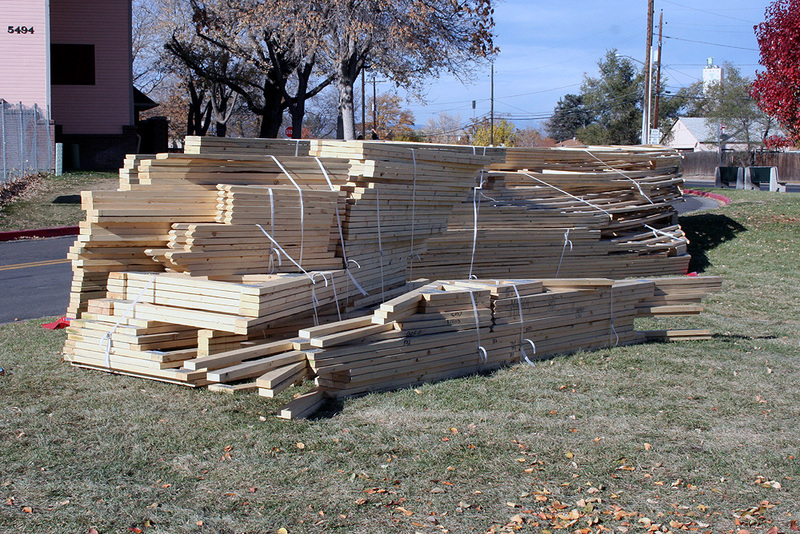 Typically, when building with wood you want many smaller fasteners that distribute the load out evenly rather than a few large fasteners concentrating the load. We are often asked by contractors if they can substitute framing staples instead of nails for their wall and roof sheathing fasteners. There is no easy universal answer to this question because the location of the project may place it in a high wind or seismic zone that may require special engineering for the fastening systems. However, according to the International Building Code, there is a fastening schedule under Table 2304.9.1 (2006 IBC) that lists the approved equivalent fasteners for nails and staples in a wide array of assemblies not subject to these special engineering conditions. For example, according to the table, 7/16″ OSB (Oriented Strand Board) wall sheathing may be fastened with 6d common, box or casing nails OR 1-3/4″ 16 gage staples at 6″ on center at the panel edges and 12″ on center in the field (special conditions apply for shear walls). Similarly, 19/32″ OSB roof sheathing would be 8d common, box or casing nails at 6″ on center at the panel edges and 12″ on center in the field OR 2″ 16 gage staples at 4″ on center at the panel edges and 8″ on center in the field. Note the differences in the specification and length of the fasteners as well as the nail/staple patterns. This is important to follow and there will always be a specification for fasteners at the edges as well as in the field. Also note that these specifications are relevant only to the thickness of the sheathing panel as well as the material specification described. For example, a thinner OSB panel or a same thickness particle board or gypsum board panel will require a different fastener specification. The specifications in the table are minimum requirements and failure to follow those specifications will result in weakness in the sheathing that can contribute to a number of potentially severe problems down the road. It is also important to verify the installation of these fasteners as they are quickly concealed by roofing and siding installations shortly after they are in place. It has been our experience that projects near our offices in the front range and mountains of Colorado, as well as near our central Texas office and in many other locations, we can typically use this table to determine the fastener alternatives. 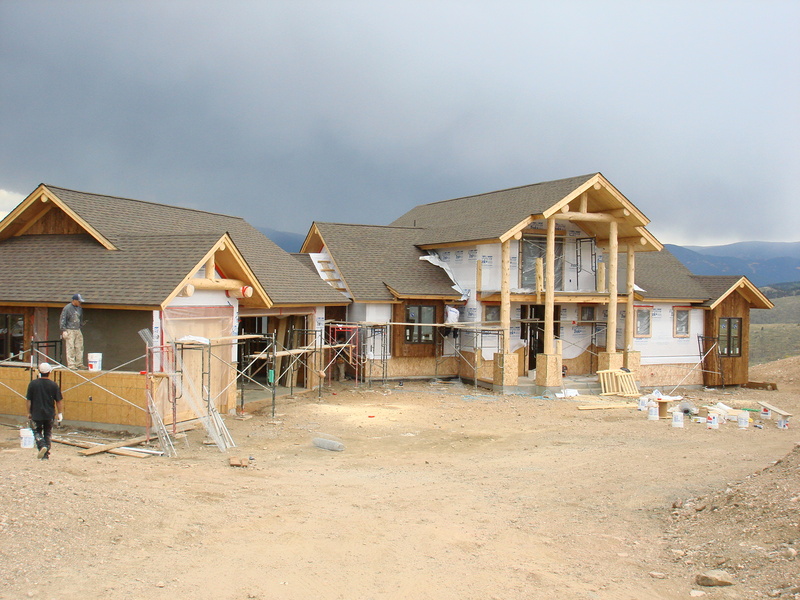 However, be sure to consult with your architect or engineer before simply assuming that your project is not subject to a higher design standard due to the climate or seismic conditions of your location. 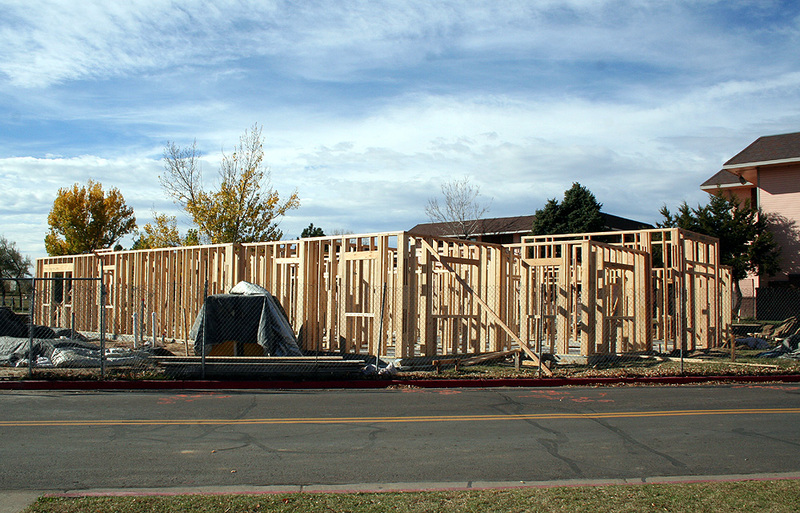 I drove by the Holly Park Community Center and the wall framing is just about complete. The trusses are sitting across the street ready to be set in the next few days.